Cet article est la traduction anglaise d’une étude publiée en 2013 : Vanhulle (D.), « Les stèles funéraires royales des deux premières dynasties à Abydos. A propos de la “steÌle” de Den des Musées royaux d’Art et d’Histoire de Bruxelles », in Chronique d’Egypte, vol. 88, n°176, 2013, pp. 203-229). Il est important de noter que cette version, revue et augmentée, n’est pas en tout point identique à son modèle et qu’elle doit être considérée comme la version la plus aboutie. A number of Early Dynastic (3100-2600 BC) royal funerary stelae were discovered by É. Amélineau at Abydos at the end of the 19th century. They were later distributed to several museums’ collections around the world, but have not been the focus of a detailed study. At least one funerary stela survives for most pharaohs of the first two dynasties. Following W.M.Fl. Petrie’s interpretation, it has generally been assumed that the stelae were produced in pairs and that they flanked the main entrance of each royal tomb (1). However, a comprehensive analysis of the data at our disposal demonstrates that such general assumptions should be considered with caution. The so-called "stela of King Den" (2) (fig.1), has been on display for over a century in the Royal Museums of Art and History in Brussels (inv. E.562) (3). In its current form, it is mostly a modern reconstruction based on better preserved royal stelae. Little information about this fragment before its arrival in Belgium is known, and this piece has often been confused with a "mortar", now in the Royal Museum of Mariemont (Morlanwelz, Belgium). This led to the unfortunate omission of the "stela" in most studies dedicated to the royal necropolis of Abydos. Discovered by É. Amélineau in the necropolis of Umm el-Qa’ab in 1895/1896, the stone fragment remained in France for almost a decade, until the Egyptologist sold a large part of his discoveries at auction in Paris in 1904 where it was bought by J. Capart, the assistant curator of the Egyptian collection of the Royal Museums of Art and History. R. Warocqué, the wealthy owner of the estate of Mariemont and famous collector of antiquities, also acquired some of the objects put on sale, including an imposing fragment of a greywacke (4) artefact (fig.2). About two thirds of this object are preserved, and the name of King Den is inscribed on its surface. Known as the "mortar of Den" (5) since its discovery, it was recently described as a "basin" (6) but its true nature remains mysterious. This object and the "stela" fragments acquired by J. Capart belonged to the same sale lot (7), and bear obvious similarities: both are carved in the same stone and the signs on their surface were created with the same technique. Their apparent resemblance, combined with the lack of archaeological documentation, led to a series of unfortunate and persistent confusions. While listing the royal stelae of the first two dynasties (8), H.G. Fischer was the first to point out the inconsistencies surrounding Den’s “stela” (9). For example, in Porter and Moss' Topographical Bibliography, the text mistakenly refers to the "mortar" of Mariemont while describing, in fact, the Brussels "stela" (10). Our primary goal was to give to this object the place it deserves within Egyptological documentation. However, it soon became clear that it is most unlikely to be a royal funerary stela. This paper first presents the observations that led to the reidentification of this piece; it then reviews the royal stelae from Abydos on the basis of an updated inventory. The Brussels stela consists of three greywacke fragments that were originally part of a larger monument. The "stela" was reconstructed with a height of 78.5 cm and a width of 54.5 cm; it has an approximate thickness of 15 cm. For the purpose of this study, the “stela” was removed from its display niche in order to observe its back, which seems to have been left rough by the carver (fig.3). Depressions and asperities indicate that the rear is quite damaged and was not intended to be seen. This suggests that the "stela" was probably set in a niche or against a wall. The main fragment, engraved with the name of Den, is by far larger than the other two secondary pieces. Only part of the inscription is preserved, and the rest of the object has been carefully reconstructed in plaster. This reconstruction was carried out on the basis of better preserved stelae, such as the one of King Djet now in the Louvre Museum (E 11007, fig.6). These royal stelae are rectangular in shape with a rounded top. The right edge of the Brussels “stela” is partly preserved, showing that the sides of this object are not parallel to the serekh as expected, but are instead slanting upward so that the upper part of the object was narrower than its base. Royal funerary stelae are also inscribed with the name of the king set in a serekh (11). The upper part of the Brussels’ falcon is not preserved but has been reconstituted based on the large Mariemont "mortar". The name of Den is rendered by two hieroglyphs, the hand ("d") and the water ("n”), and it can be understood as "the Crusher" (12). The serekh is enclosed in a raised relief rectangular frame, a feature never found on Protodynastic funerary stelae (cf. infra). Including the frame, the inscription has a preserved width of ca. 12.5 cm, and a height of 12.5 cm on the left and 11.4 cm on the right. The frame is about 1 cm thick and is restored to a height of 19.5 cm. The palace facade of the serekh is ca. 9.5 cm high and 7.3 cm wide. The surface is polished, except for the background of the raised inscription within the frame, which was left slightly hammered. This is similar to the inscription on the "mortar" of Mariemont. The "mortar" of the Royal Museum of Mariemont is a massive hemispherical basin hammered without care on the whole of its surface. The lower surface was likely modified in antiquity. The original flat and circular base was roughly recut into an irregular and globally circular one (13). The basin has a diameter of 76 cm, is 35 cm high, and the width of the edge is 10 cm. It is ca. 15 cm deep and at the bottom is a circular depression, marked with concentric grooves, that was added at an unknown time. This looks like the object has been transformed in a pivot socket, but nothing allows confirming this hypothesis. The basin was inscribed on its exterior surface. The king’s name is enclosed in a subrectangular frame that is ca. 19 cm wide at the top, 18 cm wide at the bottom, 16.5 cm high on the left, and 15.5 cm high on the right. Although the frame is larger on the basin, the dimensions of the hieroglyphs and the thickness of the frame match perfectly those of the inscription on the Brussels “stela”. Additionally, the serekh on the basin measures from 8 to 8.3 cm in height and 7.3 cm in width (14), which is also similar to what was noted for the "stela". All these similarities demonstrate the close relationship between these two artworks. By comparison with other royal stelae, it appears that the quality of execution of the serekh on both the Brussels and Mariemont artefacts is by far inferior. Moreover, the state of the back of the Brussels fragments and the numerous alterations observed on the “mortar” suggest that both objects may, in fact, be unfinished. The funerary complex of Den was discovered by É. Amélineau during his first campaign at Abydos (15) (fig. 15). The French Coptologist, sadly remembered for his flaws when it comes to archaeological work, conducted several campaigns there until 1899. W.M.Fl. Petrie, probably his fiercest critique, resumed excavations between 1900 and 1901 in an attempt to rescue what could still be saved (16). Our current knowledge and understanding of the royal necropolis, and especially of Den’s tomb, is primarily the result of the work carried out by the German mission at Umm el-Qa’ab since 1977 (17). The reports published by É. Amelineau are far from rigorous; although they inform us about his daily activities, there is few concrete information regarding his fieldwork methods or the archaeological contexts of his discoveries (18). He was strongly criticised by his peers, in part because of his unscientific methods, but also because his grip on a site of such importance was the object of jealousy. Accused of amateurism, his scientific reputation, yet exemplary (19), was tarnished: “... and worst of all, for history, came the active search in the last four years for everything that could have a value in the eyes of the purchaser, or be sold for profit regardless of its source; a search in which whatever was not removed was deliberately and avowedly destroyed in order to enhance the intended profits of European Speculators; a search after which Amélineau wrote of this necropolis: “tous les fellahs savent qu’elle est épuisée” (20). In his reports, É. Amélineau only published the approximate dimensions of the tomb of Den, together with an imprecise plan. He explained that the funerary chamber was destroyed by fire and that part of the walls collapsed inwards : « c’était un massif considérable de maçonnerie, et cependant l’incendie qu’allumèrent les dévastateurs en cette tombe fut si violent que toutes les briques furent cuites et qu’une grande partie tombèrent dans la tombe qu’elles comblèrent » (21). Regarding the tomb’s contents, he described that « le nombre considérable de vases en pierre dure qui furent rencontrés à toutes les profondeurs, mais surtout au fond »…" (22). He also mentioned the pink granite pavement and what he thought to be an anepigraphic stela carved out of the same material, two objects of a probable pharaonic date, and a stela bearing the name of Amasis (23). Further, there were fragments of wood inscribed with the name of Den. In his chapter devoted to the royal stelae, (24) he discussed the "mortar" of Mariemont: the piece, which he thought to be in granite, was discovered inside the tomb, in a fragmentary state and inscribed with the name of a king. He pointed out that the same inscription was visible on another fragment (fig. 16) (25). This second fragment is most likely the one that became, eight years later, the “royal stela” of Brussels. Indeed, no other mention of a fragment of a stela in hard stone bearing the name of Den is mentioned in his publications. Interestingly, É. Amelineau never considered that the fragment could be part of a stela, but thought that it was a missing portion of the "mortar". As most of the other artefacts that have been unearthed in the grave, the “mortar” and the fragments were found "parmi les décombres de ce tombeau" (26) and has no precise archaeological context. When he reinvestigated Den’s tomb, W.M.Fl. Petrie found a uninscribed limestone stela with a rounded top on the floor of Den’s burial chamber (27). Numerous fragments of other stelae were discovered in the vicinity of the tomb; according to the Egyptologist, the king was never named "Den", but rather "Setui" (28). In addition, prior to his excavations of the tomb, he states : "I found two (stelae) of Merneit, one almost perished; there were two of Qa, one found by the Mission Amelineau, one by myself; and though only one has been found of Zet and Mereskha, yet one such as well be lost, as none have survived of Zer, Den or Azab" (29). It seems that either W.M.Fl. Petrie, despite his very good knowledge of the results of the French excavations (30), was not aware of the Brussels “stela”, or that he did not identify the fragment as such. Den's tomb (fig.4) marks a new stage in Egyptian funerary architecture. Its entrance is on the East side, where a staircase connects the burial chamber to the outside. This notable innovation continued to be built until the reign of Qa. Among the subsidiary chambers is a room, in the southwest corner of the complex, which Fl. Petrie identified as the burial chamber of a member of the royal family (31). This room is connected to the outside by a staircase, which was found blocked by a slab. The staircase faces west and is thus aligned on the big wadi that leads to the plateau of Umm el-Qa’ab. This orientation is certainly not fortuitous; its symbolism, as well as the discovery in this room of a limestone block identified as a possible base for a statue, suggest that this chamber was more likely the equivalent of the serdab of the Old Kingdom (32). Whatever its function, it is clear that this room was an important element of the funerary complex of the king (33). Den stands out from his predecessors by the use of hard stones in funerary architecture. This practice does not seem to have been followed by his successors until the reign of Khasekhemwy, last king of the 2nd dynasty, who used limestone slabs in his tomb (34). However, from Den’s reign onwards, royal stelae were mainly made in hard stones such as greywacke, basalt or granite, while stelae of the first four kings of the 1st Dynasty and of Merneith (Den’s mother and queen regent before his accession to the throne) were all made in limestone. Only private stelae continued to be manufactured in limestone after Den’s reign (35). The presence of J. Capart at the Amélineau sale in Paris, but also the agreements and friendship that bound him to W.M.Fl. Petrie, allowed the RMAH to acquire a significant share of the objects uncovered by the two archaeologists (36). The "stela" of Den is mentioned for the first time in August 1904. In a notice published in the Bulletin of the Royal Museums of Decorative and Industrial Arts, J. Capart summed up his latest acquisitions for the Egyptian section and dealt with the objects purchased in Paris a few months earlier. He mentioned a fragmentary royal "stela" bearing the name of King Den and indicated his intention to put it on display after its reconstitution (37). Unfortunately, no image of the fragment accompanies the text. Instead, he illustrated his note with the photograph of a private stela discovered in a subsidiary burial (38). No drawing or photograph of the stela before its restoration exists in the archives of the RMAH (39). The only mention of the fragment prior to its exhibition lies in a letter sent by J. Capart to E. Van Overloop, then chief curator, on the 20th of February 1904. J. Capart informs him of the purchase of "un fragment important d’une stèle royale en granit au nom du roi Den de la première dynastie" and states that "grâce à une pièce achetée par M. Warocqué, ainsi que grâce à des documents analogues publiés, il a été possible de reconstituer entièrement la stèle royale" (40). The auction catalogue does not contain any reference to the Brussels fragment. But the lot containing the "mortar" of Mariemont also contained other fragments, said to have been found nearby (41). The lot was split between R. Warocqué, who bought the "mortar", and J. Capart, who only managed to obtain the fragments. Because J. Capart mentioned the price he paid in front of this particular lot in his copy of the sales catalogue, it is certain that these fragments are those of the second inscription mentioned by É. Amélineau. This grouped entry is the cause of the recurrent confusion between the two objects. As to the reasons behind J. Capart’s identification of the fragment, they may be political and personal. On the one hand, J. Capart may have taken advantage of the shape of the inscribed fragment to propose the reconstitution of a royal stela, thus offering his institution a masterpiece on a par with, for example, the famous stela of King Djet (fig.6) acquired by the Louvre at the same sale. On the other hand, the latent competition that existed between him and R. Warocqué, whose colossal wealth enabled him to acquire antiquities that were unaffordable for the Royal Museums of Brussels (42), could also have influenced him. Indeed, by transforming the fragment into a masterpiece, J. Capart managed not only to justify his purchase to his hierarchy, but also to deprive his opponent of the satisfaction of having obtained the biggest slice of the cake. This identification of the fragment by J. Capart has never been questioned. However, careful comparison with other royal stelae highlights several discrepancies, demonstrating that the Egyptologist – for once - was most likely mistaken. First, a recurring feature on royal stelae of the 1st dynasty is the presence of a border along the edges, which is not present on the "stela" of Den. This is certain, as the right edge of the object is fully preserved on the main fragment. Second, the sides of the stelae are parallel to the serekh, conferring a certain symmetry to the whole object. 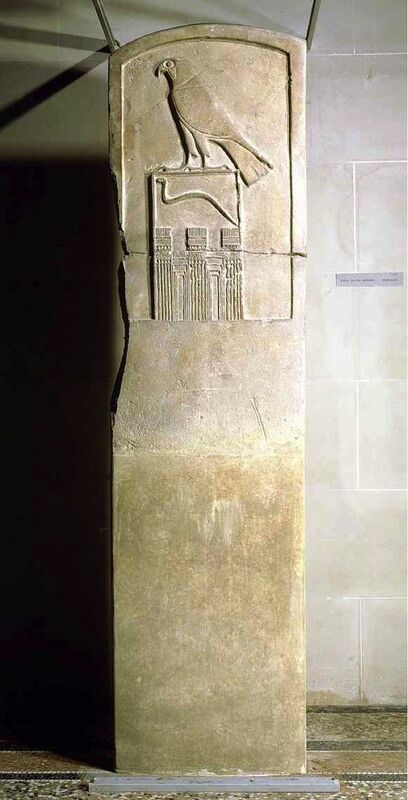 As stated above, the sides of the Brussels "stela" are not straight and the piece lacks this characteristic symmetry. Third, the niched facade of the serekh and Horus itself seem contracted and very small in regard to the available space (43). Finally, the strong degradation observed on the back of the “stela” suggests that it was unfinished and/or intended to be placed in a niche, which is unlike other royal stelae from Umm el-Qa’ab. These differences between Den’s “stela” and the others are striking and suggest that the Brussels fragment does not belong to a royal stela. 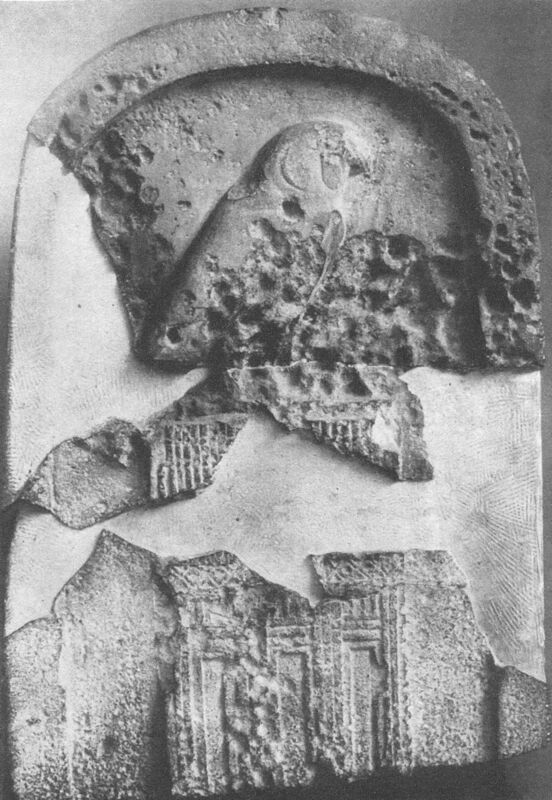 The only similarity between the Brussels fragment and a royal stela is the near-identical carving technique used for the stela of Semerkhet (fig. 7), the penultimate pharaoh of the 1st dynasty. However, other details differ significantly, such as the size of the king’s name. Further, the niches and recesses of the palace facade, always carved, are only indicated by discrete incision” on the "stela" of Den and on his "mortar". 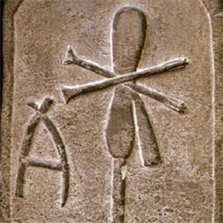 The fact that the serekh and Horus are contained in a rectangular frame in raised relief is also unique. This enclosure emphasises the isolation of the king’s name and of the depiction of the god himself. On Early Dynastic royal stelae, Horus is always the most prominent depiction, a symbol of royal and divine power, emphasised by the fact that the primary goal of these monuments was to perpetuate the name of the kings for eternity. If Den’s "stela" was originally of a size similar to those of other 1st Dynasty kings, which are over 1 metre in height, the diminutive size of the serekh would be all the more evident, and the credibility of the reconstitution all the more weakened. It is unlikely that one of the most productive kings of the 1st dynasty was granted with an unfinished stela displaying a tiny name enclosed in a small frame. A recent analysis of the "mortar" hypothesises that, before being transformed into an unfinished basin, the piece was part of an architectural composition (44). The strong similarities between the Brussels fragment and the "mortar" of Mariemont, added to the fact that both were discovered close to each other, suggests that the fragments of Den's “stela” may actually be another portion of the same architectural element. The nature of such an architectural composition remains nevertheless mysterious. Indeed, the interior of the burial chamber was originally occupied by a wooden chapel and there is no evidence pointing to the existence of any architectural or decorative structures in stone. However, various phases of construction of the tomb have been identified, including the reuse of a granite block as a threshold (45). These heavy and imposing objects in greywacke could perhaps also be remnants of these successive architectural stages. It is also possible, although far less likely, that they were placed inside the burial chamber and left there, unfinished, after the death of the king. Their final emplacement in the tomb, and perhaps also their fragmentation and transformation, is better explained by the excavations of the royal necropolis during the Middle Kingdom, in margin of the quest of the tomb of Osiris, and by their punctual refurbishing during the New Kingdom and the Late Period (46). The intensive looting that took place in Umm el-Qa’ab during most of Antiquity should also be mentioned. This review of the evidence shows that it is highly implausible that the Brussel fragment was part of a royal funerary stela. Moreover, É. Amélineau stated that this piece and the "mortar" were unearthed inside the grave, under the rubble. This is, obviously, an unlikely location for a stela. Royal funerary stelae were erected outside the tombs’ superstructures. In one instance, fragments of a stela were found buried (47), but this specific example of Den’s tomb is problematic as the walls of the burial chamber, 6 metres underground, collapsed inwards, likely causing material from above to fall in the tomb’s shaft. 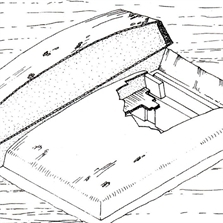 In any case, this material should be in the upper layers of the filling, not at the bottom. Excavations at Abydos have revealed at least one funerary stela for most of the kings of the 1st and 2nd dynasties. The stela of Raneb is an exception because it comes from Mitrahina, in Memphis. A fragment identified by Fl. 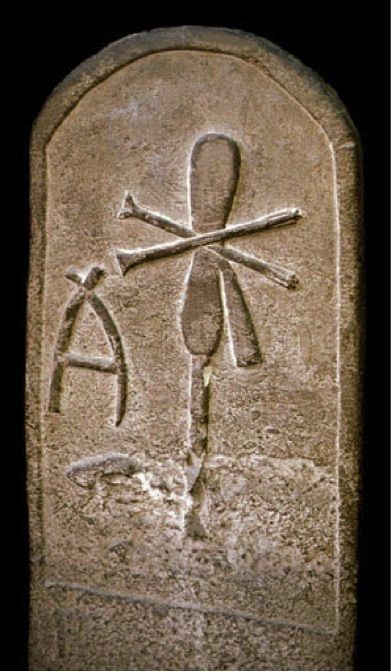 Petrie as the possible vestige of a stela belonging to Narmer (48) is considered to be the oldest example of a royal stela currently known. Because there are no remains of hieroglyphs on it, it is almost impossible to ascertain this identification. One stela in sandstone, kept in the Musée du Louvre-Lens (inv. E 21710) (49), deserve to be mentioned here (fig. 12). It has approximately the same dimensions and shape that the Brussels "stela": 63,5x56,5x16 cm. The sale catalogue mentions a high of 78 cm. This suggests that the stela was originally higher. It bears three hieroglyphic signs: the "s", the "t" and the ram, which could be read "Khnoum" (50) (as the ram-god), "bȜ" (ba) or "sr" (ser). 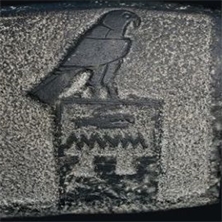 Separated from the rest of the inscription and slightly underneath is the rendition of the Hawk Horus ("Ḥr"). This leads to the lecture "Sebat" (51), "Srt-Ḥr", which would be the name of a woman, or "Setkhnoum" (52). The stela seems far too large to belong to a private buried in a subsidiary grave and the presence of Horus suggests a link to kingship. 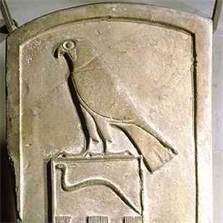 The hawk is located near the right edge of the stela and does not seem to stand on a Serekh. However, since the lower half of the object is highly eroded, it is impossible to affirm it. Discovered between the tombs of Den, Semerkhet and Qa (53), it is difficult to associate this piece with one particular grave of Umm el-Qa’ab. The exhaustive catalogue of royal funerary stelae from the Early Dynastic Period counts ten entries for eight kings (54). Petrie Museum, University College London, inv. UC 14278. Prov. : Umm el-Qa’ab (tomb B10). Selected references: Abydos I (1902), p. 8, pl. xiii; PM V, p. 88. Egyptian Museum, Cairo, JE 34992. Prov. : Umm el-Qa’ab (tomb O). Selected references: Petrie, RT II, p. 32; PM V, p. 78; Fischer (Henry G.), « An Egyptian Royal Stela of the Second Dynasty », Artibus Asiae, vol. 24, n°1, 1961, p. 52, fig. 6; Eaton-Krauss (Marianne), « The Stela of King Djet. A Masterpiece of Ancient Egyptian Art », in Blöbaum (Anke Ilona) et al., Pérégrinations avec Erhart Graefe. Festschrift zu seinem 75. Geburtstag, Munich, 2018, p. 126-127, fig.4. Louvre Museum, Paris, E. 11007. Prov. : Umm el-Qa’ab (tomb Z). Dims: 143×65×25 cm (originally higher than 2m according to É. Amélineau). Selected references: Amélineau, Abydos (1899), p. 244, fi . 63, pl. xlii ; PM V, pp. 82-83 ; Bénédite (Georges), « La stèle dite du roi serpent (Musée du Louvre) », in Monuments et mémoires de la Fondation Eugène Piot, t. 12, fasc. 1, 1905, pp. 5-18 ; Eaton-Krauss (Marianne), « The Stela of King Djet. A Masterpiece of Ancient Egyptian Art », in Blöbaum (Anke Ilona) et al., Pérégrinations avec Erhart Graefe. Festschrift zu seinem 75. Geburtstag, Munich, 2018, p. 119-131. Egyptian Museum, Cairo, JE 34550. Prov. : Umm el-Qa’ab (tomb Y), against the eastern wall of the funerary chamber. Selected references: Petrie, RT I, pp. 6, 11, 26, pl. lxiv, n °6, frontispice; Maspero (Gaston), Guide du visiteur du Musée du Caire, 4e éd., Le Caire, 1915, p. 301 (3076 (55)); PM V, p. 82. Egyptian Museum, Cairo, CG 14633. Prov. : Umm el-Qa’ab (tomb U), eastern side of the tomb. Material: hard stone (granite, greywacke, or basalt). Selected references: Amélineau, Abydos (1899), p. 245, fig. 65; Petrie, RT I, p. 6; Clarke (Somers) and Engelbach (Reginald), Ancient Egyptian Masonry, Oxford, 1930, fig. 21; PM V, p. 85; Quibell (James Edward), Catalogue général des antiquités égyptiennes du Musée du Caire. Nos 11001-12000 et 14001-14754: Archaic Objects, Le Caire, 1904-1905, p. 207, pl. 62. University of Pennsylvania Museum, Philadelphia, E.6878. The lower section was originally kept in the Egyptian Museum in Cairo (CG 14632). Prov. : Umm el-Qa’ab (tomb Q), eastern side of the tomb. Selected references: Petrie (W.M. Flinders), RT I, p. 6, 15, 26, pl. 1; Petrie (W.M. Flinders), Abydos I (1902), p. 6, pl. v; PM V, p. 86; Quibell (James Edward), Catalogue général des antiquités égyptiennes du Musée du Caire. Nos 11001-12000 et 14001-14754: Archaic Objects, Le Caire, 1904-1905, p. 297, pl. 62; Fischer (Henry G.), « Varia Aegyptiaca », in Journal of the American Research Centre in Egypt, vol. 2, 1963, p. 41; O’Connor (David), « Abydos and the University Museum: 1898-1969 », Expedition, vol. 12, p. 31; Thomas (Nancy) and Trigger (Bruce) (Edd), The American Discovery of Ancient Egypt, Los Angeles, 1995, p. 117; Engel (Eva-Maria), Umm el-Qa’ab VI. Das Grab des Qa’a : Architektur und Inventar, Wiesbaden, Deutsches Archäologischen Instituts. Abteilung Kairo. Archäologische Veröffentlichungen 100, p. 86. Egyptian Museum, Cairo, CG 14631 & JE 31860. Prov. : Umm el-Qa’ab (tomb Q). Selected references: Amélineau, Abydos (1899), p. 245, fig. 64; Maspero (Gaston), Guide du visiteur du Musée du Caire, Le Caire, 1914, p. 285 (3051 ; PM V, p. 86 ; Quibell (James Edward), Catalogue général des antiquités égyptiennes du Musée du Caire. Nos 11001-12000 et 14001-14754: Archaic Objects, Le Caire, 1904-1905, p. 206, pl. 62; Engel (Eva-Maria), Umm el-Qa’ab VI. Das Grab des Qa’a : Architektur und Inventar, Wiesbaden, Deutsches Archäologischen Instituts. Abteilung Kairo. Archäologische Veröffentlichungen 100, p. 86, Abb. 65. Metropolitan Museum of Art, New York, MMA 60.144. Selected references: Fischer (Henry G.), Artibus Asiae, vol. 24, n°1, 1961, pp. 45-53, fig. 2 et 10; Roehrig (Catharine H.) and Serotta (Anna), in Patch (Diana C.) (Ed. ), Dawn of Egyptian Art, New York, Metropolitan Museum of Art, 10th of April – 5th of August 2012, pp. 210-211. Prov. : Umm el-Qa’ab (tomb P), south-west of the tomb. Selected references: Petrie, RT II, pp. 11-12, 33, pl. xxxi ; PM V, p. 81 ; Fischer (Henry G.), Artibus Asiae, vol. 24, n°1, 1961 pp. 54-56, fig. 7; Strudwick (Nigel), Masterpieces of Ancient Egypt, London, 2006, pp. 42-43; Spencer (Alan Jeffrey), Catalogue of Egyptian Antiquities in the British Museum V. Early Dynastic Objects, London, 1980, p. 16, pl. 8-9. Egyptian Museum, Cairo, JE 3526. Material: granite [according to Fischer]. Selected references: Maspero 1915, p. 300 (3068). Royal stelae stood above the tombs of their owner, or, at the very least, near their emplacement. It is indeed important to note that no superstructures survived in Umm el-Qa’ab and that the royal tombs, as far as we know, were only surmounted by the flat sandy surface of the desert (56). The hypothesis of an above-ground mound made of bricks and sand is strictly conjectural (57). 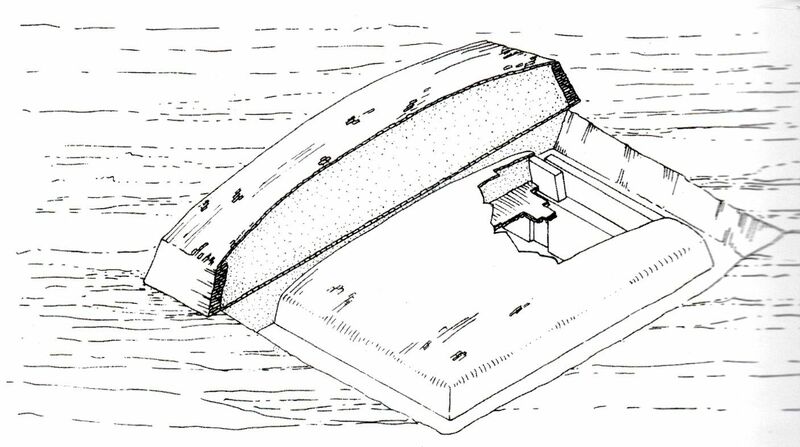 The only architectural feature that could be identified as a superstructure is a "subterranean tumulus lined with mud bricks" and filled with sand (58) (fig. 13). Moreover, no access from the outside should be postulated before the reign of Den and the addition of a staircase to the tomb. The stelae were then, probably, the only visible tomb marker. The precise location of the stelae remains uncertain. 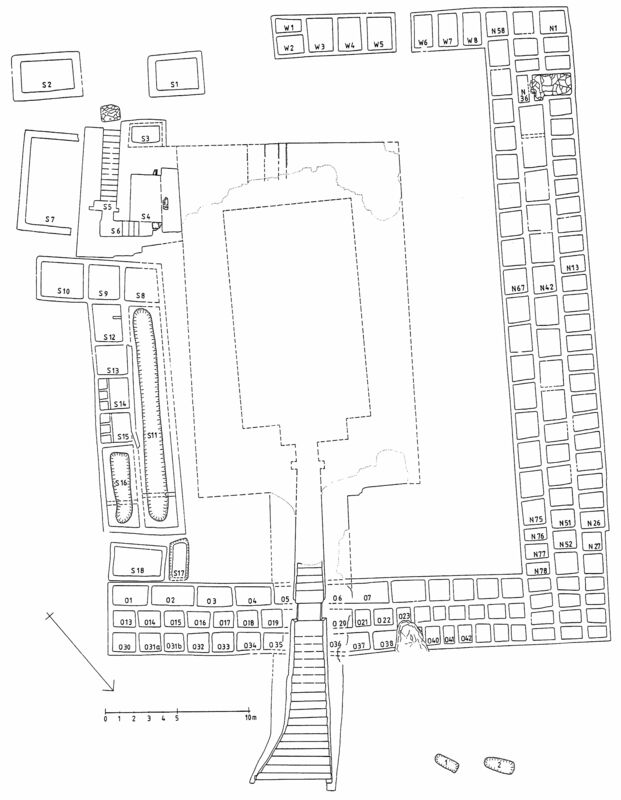 The archaeological record informs us that the stelae of Qa supposedly stood at the north of the tomb (against the hypothetical above-ground tumulus on some reconstitution), those of Peribsen and Khasekhemwy at the south while the others should have stood at the east, flanking the staircases (59). Caution is however necessary, because none of the stelae were found in their original position. É. Amélineau wrote about the stela of Djet (fig.6): "Ainsi, la grande stèle en calcaire qui fut trouvée dans ce tombeau avait sa place marquée à peu près au milieu du mur ouest (…)" (60). Petrie (61) later disproved this interpretation, and it is likely that the niche noted by Amélineau was some kind of "encoches rectangulaires pratiquées dans l’enduit, dont la fonction est d’ouvrir magiquement un passage" (62). According to David O'Connor, stelae were located to the south of the tombs, in combination with a structure that could have been a shrine. He further suggests that the underground "serdab" of Den discussed above would have existed within the other funerary complexes of the 1st dynasty, but rather above ground (63). These hypothetical shrines, now completely lost, would explain the absence of structures in the south corner of 1st dynasty funeral complexes (fig. 14). However, this theory is not unanimously accepted and one could also consider that the unbuilt area in the south-west corners are openings oriented towards the wadi, which could be considered, from a symbolic perspective, as the gate to the afterlife. These observations are not relevant for the tombs of the 2nd dynasty, which open to the south and have no free space in their south corner. The royal stelae vary in size. The serekh, at the centre, filled most of the available space and the lateral borders are parallel to it. 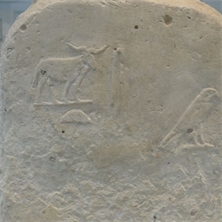 A large section of the limestone stelae of Djet (fig.6) and of Merneith (fig.7) was left blank below the serekh, supposedly because this part was meant to be partly buried in the ground. Fl. Petrie considered that the weathering visible on the surface of the upper part of Merneith’s stela, in contrast to the lower part, was a testimony of this original position (64). The stelae carved out of harder stones, shorter than those in limestone, may have been simply laid on the floor or on a base. Recently, M. Eaton-Krauss suggested that the stela of Djet “and its missing pendant were set up like the Medum stelae, so that the relief decorated apex naming the king was visible above a low enclosure wall built around them” (65). The hawk-god Horus and the hieroglyphic signs follow the same orientation, which can be indifferently toward the left or the right. It is possible that the stelae were located on either side of the entrance, and that the hawks were facing each other. For this hypothesis to be valid, there needs to be a pair of stelae for each king. This is certainly the case for two of them, Qa and Peribsen, and also for Merneith (66), but only one stela has been discovered for the others. It is therefore necessary to nuance the oft-written affirmation that each royal tomb of the first two dynasties possessed two identical stelae (67). This being said, M. Eaton-Krauss convincingly stated that Djet also had two stelae, since the only one discovered shows that the god Horus and the snake are both oriented leftward, which is in contradiction with the usual rightward orientation of Hieroglyphic writing and, more significantly, with almost all of the non-royal stelae from Umm el-Qa’ab. This suggests, indeed, that a second stela with the signs oriented rightward existed (68). Stelae of the 1st dynasty are of two types: those in limestone, in use from the reign of Narmer to that of Merneith, and those in hard stone manufactured from the reign of Den until the end of the 2nd dynasty. All the hard stone stelae were considered to be made in granite upon their discovery, before various identifications, such as granodiorite, schist, quartzite, or basalt, were proposed by curators. However modern analysis of the Brussels fragment and of the "mortar" of Mariemont (69) by Th. De Putter showed their material to be greywacke (70). It is not impossible that other identifications, notably that of the stone of Semerkhet’s stela (fig.7), may be erroneous and in need of re-examination (71). According to H.G. Fischer, the upper part of one of Qa’s stelae (fig.8) shows all the characteristics of basalt, while the lower section of the stone is lighter and less dense, with a hardness coefficient ranging from 5 to slightly less than 4 (72). He concludes: "I doubt if it is so generally realized that an igneous rock such as basalt need be no harder than a compact sedimentary rock like schist" (73). This latter material can easily be mistaken for basalt because of its homogeneous and smooth appearance, especially when it has a very dark hue (74). Moreover, the scattering of the different pieces of the stelae around the tombs for several millennia may have altered each stone fragment in different ways. Limestone stelae are often damaged, this rock being particularly sensitive to erosion. Their current appearance may seem quite rough, sometimes even deformed. The most remarkable and best preserved example is the stela of Djet (fig.5). Originally exceeding 2,5 metres in height, it has a rectangular shape with a slightly curved top. The surface is smooth, and the borders are in raised relief. The right top corner of the border seems higher and wider than on the left. Horus is well centred and the serekh is shifted to the left, presumably to keep the balance of the composition. The other stelae of this first group follow the same pattern with the notable exception of Merneith’s stela (fig.6), which has no serekh. This lack of royal and divine recognition should perhaps be related to her role as regent, Den being too young at the death of his father to claim to crown. This role probably granted her the privilege of being buried in the royal necropolis, but was not enough for her being deified (75). 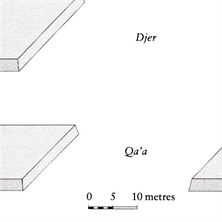 In contrast, the stela of Djer (fig.4) is stockier, with a very thick lateral border. Its bottom section may not be fully preserved, so that at first sight it appears to resemble stelae of hard stone. Kings of the 2nd dynasty favoured granite for their stelae, which decrease in size and are no longer decorated with a border. One can also note that Peribsen’s stelae are slenderer, and have a rough finish. This lack of uniformity in the manufacture of such important objects may surprise. However, we demonstrated that limestone, greywacke and basalt were used for 1st Dynasty royal stelae, with limestone the material of choice until Den’s reign, then greywacke and/or basalt until the end of the dynasty. It seems then that there is a progression from limestone to greywacke/basalt and, ultimately, to granite. The choice of stone may have been influenced by the available time for the preparation of the stelae. Either they were made during the lifetime of the king, or after his death and under the responsibility of his successor. On the one hand, the limestone stelae are all associated with tombs that could only be closed after the deceased was buried inside (76). There may therefore be a connection between the use of limestone and the urgency of burying the dead. In this case, the confection of the stela would have been ordered by the successor. On the other hand, once a staircase allows access to the burial chamber from the outside, it becomes possible to complete the tomb before the death of the king and to progressively furnish it. The work, necessarily longer, required to carve stelae in hard stone suggests that they were commissioned by the living king for his own tomb. The lack of precise information about the archaeological contexts of these objects prevents further clarification. The Brussels fragment under discussion does not belong to a royal stela. Its dimensions and confection, but also its context of discovery and of acquisition, do no support such identification. This large piece of stone is more likely a part of an architectural element which function remains unknown. It is closely related to the "mortar" of the Royal Museum of Mariemont and were more likely part of the same structure. These architectural elements seem to have been left unfinished inside the burial chamber. This chamber was almost completely filled by a wooden funerary chapel and it is difficult to imagine how an architectural element in hard stone could have taken place inside. Considering that granite was used for the floor and the different phases of construction, one can hypothesise that the interior of the main chamber was, at a certain stage of its elaboration, mainly composed of stone structures. Semerkhet's burial chamber also contained numerous fragments of greyish stone (77). In addition, the intensive looting and destructions of the royal tombs may have removed all evidence of similar use of stone in the architecture of other tombs. One could also postulate that the excavations of the necropolis during the Middle Kingdom and the refurbishing of some royal tombs during the subsequent periods explain the presence of the fragments at the bottom of the burial chamber and, perhaps, their current state. It is thus impossible to ascertain the exact original position of these stone fragments. Stuck into the ground, placed on a support, or even in a niche, the royal stelae of the first two dynasties were significant monuments of the kings’ funerary complexes. They served as ground markers and likely played a role in cultic activities. The discovery of fragments of stoneware bearing the inscription "for the priest of the temple of King Qa" close to the stela of this king does not contradict this possibility (78). The lack of concrete information prevents us from specifying the original position of these stelae around the tomb. We know, however, that they sometimes, if not always, worked in pairs, and that since the reign of Den, greywacke, basalt, and later granite, replaced limestone. 1 Petrie (W.M. Flinders), Royal Tombs. Part I, London, Egypt Exploration Fund 20, 1900, p. 6 [= Petrie, RT I]. The royal necropolis of the 1st Dynasty is located at Umm el-Qa’ab, Abydos, some 90 km north of Luxor. 2 Den is the fifth pharaoh of the First Dynasty. His reign and that of its successor date to Naqada IIIC2 (ca 3000-2900 BC): Hendrickx (Stan), « Predynastic - Early Dynastic Chronology », in Hornung E. et al. (eds), Ancient Egyptian Chronology. Handbook of Oriental Studies. Section One. The Near and Middle East, Handbuch der Orientalistik. Erste Abteilung, Nahe und der Mittlere Osten, vol. 83, Leyde-Boston, 2006, pp. 55-93, 487-488; Dee (Michael W.) et al., « An Absolute Chronology for Early Egypt Using Radiocarbon Dating and Bayesian Statistical Modelling », Proceedings of the Royal Society A: Mathematical, Physical and Engineering Sciences, vol. 469, 2013, pp. 1-10. According to the Palermo Stone, the reign of Den last about fifty years. About king Den, see: Godron (Gérard), Études sur l’Horus Den et quelques problèmes de l’Égypte archaïque, Genève, 1990; Wilkinson (Toby A.H.), Early Dynastic Egypt, London-New York, 2000, pp. 75-78; Barker (Darrell D.), Encyclopedia of the Pharaohs. 1: Predynastic to the Twentieth Dynasty 3300-1069 BC), Cairo, 2008, pp. 78-80. 3 Capart (Jean), « Nouvelles acquisitions. Collections égyptiennes. Antiquités de l’époque thinite (I) », Bulletin des Musées Royaux des Arts Décoratifs et Industriels, 3e année (1903-1904), n°11, Brussels, 1904, pp. 81-83; Van de Walle (Baudouin), Antiquités égyptiennes. Les Antiquités égyptiennes, grecques, étrusques, romaines et gallo-romaines du musée de Mariemont, Bruxelles, 1952, p. 17, pl. i; Putter (Thierry) and Karlshausen (Christina), Les pierres utilisées dans la sculpture et l’architecture de l’Égypte pharaonique, Bruxelles, 1992, p. 88. 4 If this identification of the stone is now certain, it was originally considered to be granodiorite. Greywacke, the Bekhen stone of the ancient Egyptians, was extracted in the Wadi Hammamat (De Putter (Thierry) and Karlshausen (Christina), Les pierres utilisées dans la sculpture et l’architecture de l’Égypte pharaonique, Bruxelles, 1992, pp. 87-88). 5 Van de Walle (Baudouin), Antiquités égyptiennes. Les Antiquités égyptiennes, grecques, étrusques, romaines et gallo-romaines du musée de Mariemont, Bruxelles, 1952, p. 17, pl. i; Derriks (Claire), « L’aventure d’une collection », in Derriks (Claire) and Delvaux (Luc) (Edd. ), Antiquités égyptiennes au Musée royal de Mariemont, Musée royal de Mariemont, 2009, pp. 20-23; Hendrickx (Stan) and Eyckerman (Merel), « Les vases en pierre », in Derriks (Claire) and Delvaux (Luc) (Edd. ), Antiquités égyptiennes au Musée royal de Mariemont, Musée royal de Mariemont, 2009, pp. 305-306. 6 Hendrickx (Stan) and eyckerman (Merel), « Les vases en pierre », in Derriks (Claire) and Delvaux (Luc) (Edd. ), Antiquités égyptiennes au Musée royal de Mariemont, Musée royal de Mariemont, 2009, pp. 305-306. 7 Auction sale: Antiquités égyptiennes trouvées à Abydos. Ivoires, bois sculptés ... Vente de l’Hôtel Drouot, lundi 8 et mardi 9 février 1904, Paris, 1904, p. 30, n°186. 8 Fischer (Henry G.), « An Egyptian Royal Stela of the Second Dynasty », Artibus Asiae, vol. 24, n°1, 1961, pp. 45-56. 9 Fischer (Henry G.), « Varia Aegyptiaca », in Journal of the American Research Centre in Egypt, vol. 2, 1963, pp. 41-43. 10 Porter (Bertha) et Moss (Rosalind L.B. ), Upper Egypt: sites: Deir Rîfa to Aswân, excluding Thebes and the temples of Abydos, Dendera, Esna, Edfu, Kôm Ombo and Philae, Topographical Bibliography of Ancient Egyptian Hieroglyphic Texts, Reliefs and Paintings, vol. V, Oxford, 1937, p. 83 [= PM V]. 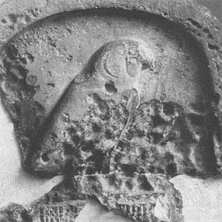 11 A serekh is the representation of a palace facade above which stands the hawk-god Horus. The name of the king is mentioned inside the facade. Like the cartouche during pharaonic times, the serekh was the official rendition of the Horus name of the king from the 1st dynasty until the course of the 3rd dynasty. See: O’Brien (Alexandra), « The Serekh as an aspect of the Iconography of Early Kingship », in Journal of the American Research Centre in Egypt, vol. 33, 1996, pp. 123-138; Hendrickx (Stan), « Arguments for an Upper Egyptian Origin of the Palace-façade and the Serekh during Late Predynastic – Early Dynastic Times », Göttinger Miszellen, nr. 184, 2001, pp. 85-110. 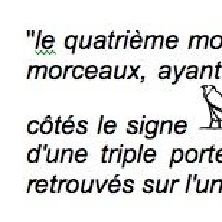 12 Godron (Gérard), Études sur l’Horus Den et quelques problèmes de l’Égypte archaïque, Genève, 1990, p. 21. 13 Hendrickx (Stan) and Eyckerman (Merel), « Les vases en pierre », in Derriks (Claire) and Delvaux (Luc) (Edd. ), Antiquités égyptiennes au Musée royal de Mariemont, Musée royal de Mariemont, 2009, pp. 305-306. 14 We would like to thank Dr Arnaud Quertinmont for allowing us to take these measures. 15 Amélineau (Émile), Les nouvelles fouilles d’Abydos, Angers, 1896, pp. 16-17; Amélineau (Émile), Les nouvelles fouilles d’Abydos. 1895-1896. Compte rendu in extenso des fouilles, description des monuments et objets découverts, Paris, 1899, pp. 119-126 [= Amélineau, Abydos (1899)]. 16 Petrie, RT I, p. 11; Petrie (W.M. Flinders), The Royal Tombs of the Earliest Dynasties. Part II, London, Egypt Exploration Fund 21, 1901, pp. 9-11 [= Petrie, RT II]. 17 Dreyer (Günter) et al., « Umm el-Qa’ab. Nachuntersuchungen im Frühzeitlichen Königsfried- hof. 3/4. Vorbericht », in Mitteilungen des Deutschen Archäologischen Instituts Abteilung Kairo, vol. 46, 1990, pp. 72-81; Dreyer (Günter) et al., « Umm el-Qa’ab. Nachuntersuchungen im Frühzeitlichen Königsfriedhof. 5/6. Vorbericht », Mitteilungen des Deutschen Archäologischen Instituts Abteilung Kairo, vol. 49, 1993, pp. 57-61; Dreyer (Günter) et al., « Umm el-Qa’ab. Nachuntersuchungen im Frühzeitlichen Königsfriedhof. 9/10. Vorbericht », Mitteilungen des Deutschen Archäologischen Instituts Abteilung Kairo, vol. 54, 1998, pp. 141-164; Dreyer (Günter) et al., « Umm el-Qa’ab. Nachuntersuchungen im Frühzeitlichen Königsfriedhof. 11/12. Vorbericht », Mitteilungen des Deutschen Archäologischen Instituts Abteilung Kairo, vol. 56, 2000; Dreyer (Günter) et al., « Umm el-Qa’ab. Nachuntersuchungen im Frühzeitlichen Königsfriedhof. 13/14/15. Vorbericht », Mitteilungen des Deutschen Archäologischen Instituts Abteilung Kairo, vol. 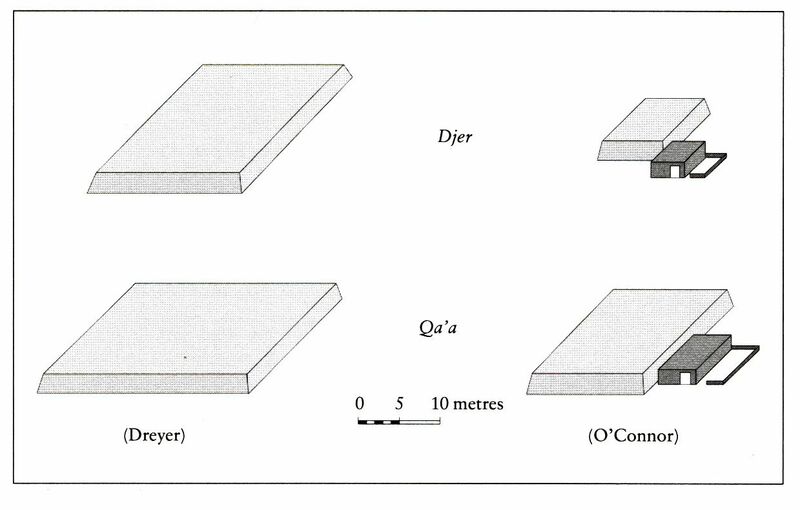 59, 2003; Dreyer (Günter) et al., « Umm el-Qa’ab. Nachuntersuchungen im Frühzeitlichen Königsfriedhof. 16/17/18. Vorbericht », Mitteilungen des Deutschen Archäologischen Instituts Abteilung Kairo vol. 62, 2006; Dreyer (Günter) et al., « Umm el-Qa’ab. Nachuntersuchungen im Frühzeitlichen Königsfriedhof. 19/20/21. Vorbericht », Mitteilungen des Deutschen Archäologischen Instituts Abteilung Kairo, vol. 67, 2011; Dreyer (Günter) et al., « Umm el-Qa’ab. Nachuntersuchungen im Frühzeitlichen Königsfriedhof. 22/23/24. Vorbericht », Mitteilungen des Deutschen Archäologischen Instituts Abteilung Kairo vol. 69, 2013; Dreyer (Günter) et al., « Umm el-Qa’ab. Nachuntersuchungen im Frühzeitlichen Königsfriedhof. 25/26/27. Vorbericht », Mitteilungen des Deutschen Archäologischen Instituts Abteilung Kairo vol. 73, 2017; Dreyer (Günter) , « Königsgräber ab Djer: Wege zur Auferstehung », in Dreyer (Günter) & Polz (Daniel) (Edd. ), Begegnung mit der Vergangenheit. 100 Jahre in Ägypten. Deutsches Archäologisches Institut Kairo 1907-2007, Mayence, 2007, pp. 197-210. 18 Amélineau, Abydos (1899); Amélineau (Émile C.), Les nouvelles fouilles d’Abydos : seconde campagne 1896-1897 : compte rendu in extenso des fouilles…, Paris, 1902; Amélineau (Émile C.), Les nouvelles fouilles d’Abydos : seconde campagne 1897-1898 : compte rendu in extenso des fouilles…, Paris, 1904; Amélineau (Émile C.), Les nouvelles fouilles d’Abydos : seconde campagne 1897-1898. Deuxième partie, Paris, 1905 [= Amélineau, Abydos (1905)]. 19 Étienne (Marc), « Émile Amélineau (1850-1915). Le savant incompris », Archéo-Nil, vol. 17, 2007, pp. 27-38. 20 Petrie, RT I, p. 2. 21 Amélineau, Abydos (1899), p. 121. 22 Amélineau, Abydos (1899), p. 123. 23 It seems that the tomb was restored in the Middle Kingdom or, in any case, under the reign of Amasis during the 26th Dynasty: Petrie, RT II, p. 11. 24 Amélineau, Abydos (1899), pp. 232, 243. 25 Amélineau, Abydos (1899), p. 245-246. 26 Amélineau, Abydos (1899), p. 125. 27 Petrie, RT II, p. 10. 28 Petrie, RT II, p. 33. 29 Petrie, RT I, p. 6. 30 Fl. Petrie published the drawings of the stelae found by É. Amélineau: Petrie, RT I, p. 27, pl. xxxii. 31 Petrie, RT II, p. 11. 32 Dreyer (Günter), Mitteilungen des Deutschen Archäologischen Instituts Abteilung Kairo, vol. 46, 1990, pp. 75-79, fig. 7. 33 O’Connor (David), Abydos. Egypt’s First Pharaohs and the Cult of Osiris, London- New York, 2009, p. 154. 34 Engel (Eva-Maria), « The Royal Tombs at Umm el-Qa’ab », Archéo-Nil, vol. 18, 2008, p. 33. 35 Martin (Geoffrey Thorndike), Umm el-Qa’ab VII. 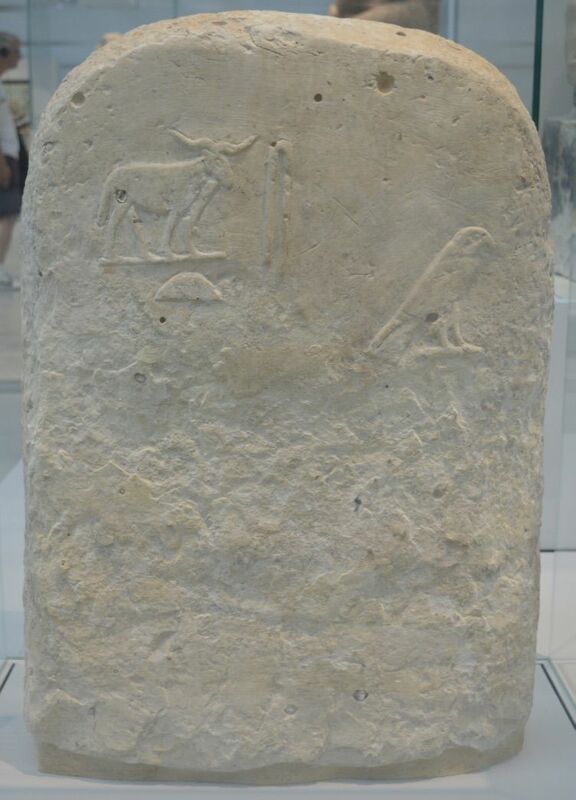 Private Stelae of the Early Dynastic Period from the Royal Cemetery at Abydos, Wiesbaden, Deutsches Archäologischen Instituts. Abteilung Kairo. Archäologische Veröffentlichungen 123, p. 1. 36 De Putter (Thierry) et al., « Les mille et un vases de pierre des premières dynasties à Bruxelles », in Karlshausen (Christina) and De Putter (Thierry) (dir. ), Pierres égyptiennes... Chefs-d’œuvre pour l’Éternité, Mons, 2000, pp. 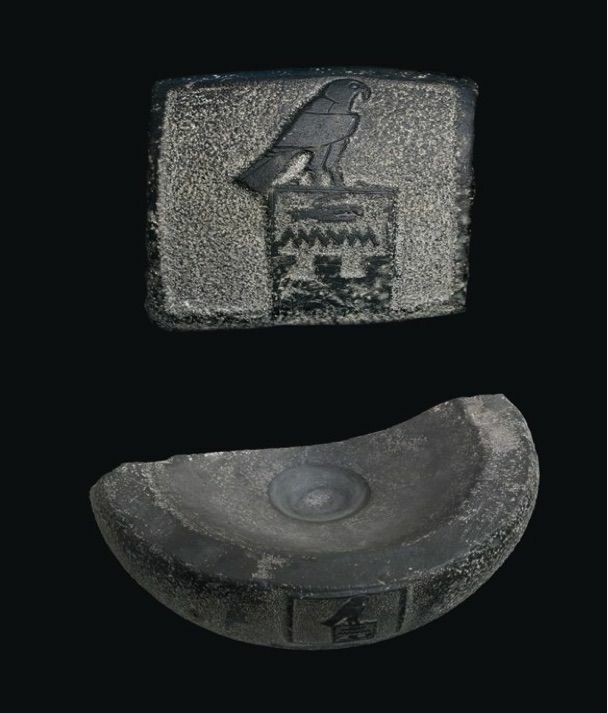 49-62; Bielen (Stijn), « The Funerary Objects from the Early Dynastic Royal Tombs at Abydos in the Royal Museums of Art and History in Brussels », in Hendrickx (Stan) et al. (Edd. ), Egypt at its Origins. Studies in Memory of Barbara Adams. Proceedings of the International Conference « Origin of the State. Predynastic and Early Dynastic Egypt », Kraków, 28th August-1st September 2002, OLA 138, Louvain, 2004, pp. 621-635. 37 Capart (Jean), « Nouvelles acquisitions. Collections égyptiennes. Antiquités de l’époque thinite (I) », Bulletin des Musées Royaux des Arts Décoratifs et Industriels, 3e année (1903-1904), n°11, Brussels, 1904, pp. 81-83. 39 We would like to thank Dr Dirk Huyge for giving us access to these archives. 40 Bruffaerts (Jean-Michel), pers. comm. This letter, written only a few days after the sale, proves that J. Capart knew exactly what to do with the fragment when he saw it, neglected alongside the “mortar”. 41 Antiquités égyptiennes trouvées à Abydos. Ivoires, bois sculptés ... Vente de l’Hôtel Drouot, lundi 8 et mardi 9 février 1904, Paris 1904, p. 30, n°186. The catalogue annotated by J. Capart during the sale is kept in RMAH archives. It confirms that the Brussel fragment comes from the same lot than the “mortar” and that it is the fragment mentioned by É. Amélineau (cf. n.26). 42 Bruffaerts (Jean-Michel), « Capart-Warocqué : une amitié manquée », in Derriks (Claire) and Delvaux (Luc) (Edd. ), Antiquités égyptiennes au Musée royal de Mariemont, Musée royal de Mariemont, 2009, pp. 39-48. 43 H.G. Fischer made similar observations some decades ago (« Varia Aegyptiaca », in The Journal of the American Research Centre in Egypt, vol. 2, 1963, pp. 41-43). 44 Hendrickx (Stan) and Eyckerman (Merel), loc. cit., pp. 305-306. 45 Dreyer (Günter), Mitteilungen des Deutschen Archäologischen Instituts Abteilung Kairo, vol. 54, 1998, pp. 141-145, figg. 31-32. 46 Müller (Vera), « Archäologische Relikte kultischer Aktivitäten in Umm el-Qa’ab/Abydos »in Mylonopoulos (Joannis) & Roeder (Hubert) (edd), Archäologie und Ritual. Auf der Suche nach der rituellen Handlung in den antiken Kulturen Ägyptens und Griechenlands, Vienna, 2007, pp. 37-52; Engel (Eva-Maria), « The Royal Tombs at Umm el-Qa’ab », Archéo-Nil, vol. 18, 2008, p. 36; O’Connor (David), Abydos. Egypt’s First Pharaohs and the Cult of Osiris, London- New York, 2009, p. 148; Regulski (Ilona), A Palaeographic Study of Early Writing in Egypt, Leuven, Orientalia Lovaniensia Analecta 195, 2010, p. 53. 47 Several fragments of a second stela of Merneith, now lost, were also discovered inside her tomb: Petrie, RT I, p. 26. 48 University College London, inv. UC 14278. It was found inside tomb B10 in Abydos, allegedly belonging to Narmer. 49 Amélineau, Abydos (1899), p. 247, pl. XLI (and not XLII as stated in the text of the publication); Amélineau, Abydos (1905), p. 670-671; PM V, p. 85; Auction sale: Antiquités égyptiennes trouvées à Abydos. Ivoires, bois sculptés ... Vente de l’Hôtel Drouot, lundi 8 et mardi 9 février 1904, Paris, 1904, p. 48, n°308; Rothe (Silke), Die Königsmütter des Alten Ägypten von der Frühzeit bis zum Ende der 12. Dynastie., Ägypten und Altes Testament 46, Wiesbaden; Martin (Geoffrey Thorndike), « An Early Dynastic Stela from Abydos: private or royal? », in Quirke (Stephen), Discovering Egypt from the Neva. The Egyptological Legacy of Oleg D. Berlev, Berlin, 2013: 79-84. 50 The long tail of the ram suggests a late 1st Dynasty date for the inscription (Regulski (Ilona), A Palaeographic Study of Early Writing in Egypt, Leuven, Orientalia Lovaniensia Analecta 195, 2010, p. 103-104). 51 Amélineau, Abydos (1905): 670-671. 52 For a discussion about this inscription and a detailed bibliography, see Martin (Geoffrey Thorndike), « An Early Dynastic Stela from Abydos: private or royal? », in Quirke (Stephen), Discovering Egypt from the Neva. The Egyptological Legacy of Oleg D. Berlev, Berlin, 2013: 79-84. 53 Martin (Geoffrey Thorndike), « An Early Dynastic Stela from Abydos: private or royal? », in Quirke (Stephen), Discovering Egypt from the Neva. The Egyptological Legacy of Oleg D. Berlev, Berlin, 2013: 80. 54 For an earlier, incomplete, catalogue, see H.G. Fischer, « Varia Aegyptiaca », The Journal of the American Research Centre in Egypt, vol. 2, 1963, p. 41. 37 fragments of a possible royal stela in silstone have been found during the German excavations of Qa’s tomb. However, it is difficult to ascertain that they belong to this tomb and not from the one of Semerkhet, which is near to it (Engel (Eva-Maria), Umm el-Qa’ab VI. Das Grab des Qa’a. Architektur und Inventar, Wiesbaden, Deutsches Archäologischen Instituts. Abteilung Kairo. Archäologische Veröffentlichungen 100, 2017, p. 86. 55 Interstingly enough, the number is 3082 in the 1914 edition of this manual. 56 Bénédite (Georges), « La stèle dite du roi serpent (Musée du Louvre) », in Monuments et mémoires de la Fondation Eugène Piot, t. 12, fasc. 1, 1905, pp. 13-14; O’Connor, Abydos. Egypt’s First Pharaohs and the Cult of Osiris, London- New York, 2009, p. 151. 57 O’Connor (David), Abydos. Egypt’s First Pharaohs and the Cult of Osiris, London- New York, 2009, p. 151-152, fig. 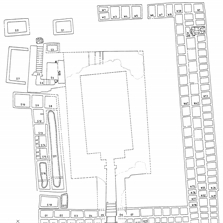 81; Engel (Eva-Maria), « The Royal Tombs at Umm el-Qa’ab », Archéo-Nil, vol. 18, pp. 35. 58 Engel (Eva-Maria), « The Royal Tombs at Umm el-Qa’ab », Archéo-Nil, vol. 18, pp. 32-33. 59 Petrie, RT I, p. 6; Engel (Eva-Maria), « The Royal Tombs at Umm el-Qa’ab », Archéo-Nil, vol. 18, pp. 35. 60 Amélineau, Abydos (1899), p. 133. 61 Petrie, RT I, p. 10. 62 Baud (Michel), « Du complexe enterré au mastaba révélé : l’invention de l’architecture funéraire et des dispositifs cultuels », in M. Étienne (dir. ), Les Portes du Ciel. Visions du monde dans l’Égypte ancienne (cat. d’exp., 6 mars - 29 juin 2009), Musée du Louvre, Paris, 2009, p. 210. 63 O’Connor (David), Abydos. Egypt’s First Pharaohs and the Cult of Osiris, London- New York, 2009, pp. 154-155, fig. 85. 64 Petrie, RT I, p. 6. 65 Eaton-Krauss (Marianne), « The Stela of King Djet. A Masterpiece of Ancient Egyptian Art », in Blöbaum (Anke Ilona) et al., Pérégrinations avec Erhart Graefe. Festschrift zu seinem 75. Geburtstag, Munich, 2018, p. 128. 66 Petrie, RT I, p. 11, pl. lxiv. 67 Notably Petrie, RT I, p. 6; Engel (Eva-Maria), « The Royal Tombs at Umm el-Qa’ab », Archéo-Nil, vol. 18, p. 35; O’Connor, Abydos. Egypt’s First Pharaohs and the Cult of Osiris, London- New York, 2009, p. 155. 68 Eaton-Krauss (Marianne), « The Stela of King Djet. A Masterpiece of Ancient Egyptian Art », in Blöbaum (Anke Ilona) et al., Pérégrinations avec Erhart Graefe. Festschrift zu seinem 75. Geburtstag, Munich, 2018, p. 128. 69 The “mortar” of Mariemont was thought to be in basalt (Van De Walle (Baudouin), Antiquités égyptiennes. Les Antiquités égyptiennes, grecques, étrusques, romaines et gallo-romaines du musée de Mariemont, Bruxelles, 1952, p. 17) before Th. De Putter analysis. 70 De Putter (Thierry) and Karlshausen (Christina), Les pierres utilisées dans la sculpture et l’architecture de l’Égypte pharaonique, Bruxelles, 1992, pp. 87-88. 71 Only new petrographic analysis of the various stelae could solve this question. 72 Fischer (Henry G.), « Varia Aegyptiaca », in Journal of the American Research Centre in Egypt, vol. 2, 1963, p. 43. 74 De Putter (Thierry) and Karlshausen (Christina), Les pierres utilisées dans la sculpture et l’architecture de l’Égypte pharaonique, Bruxelles, 1992, p. 87. 75 Wilkinson (Toby A.H.), Early Dynastic Egypt, London-New York, 2000, p. 74. Her name is mentioned on a cylinder-seal found in Den’s tomb. It does not appear, however, on the one found in the grave of Qa. Merneith perceived status most probably changed between these two reigns (Kaiser (Werner), « Zum Siegel mit frühen Königsnamen von Umm el-Qa’ab », Mitteilungen des Deutschen Archäologischen Instituts Abteilung Kairo, vol. 43, 1987, pp. 115-119; Dreyer (Günter), « Umm el-Qa’ab. Nachuntersuchungen im Frühzeitlichen Königsfriedhof. 7/8. Vorbericht », Mitteilungen des Deutschen Archäologischen Instituts Abteilung Kairo, vol. 52, 1996, p. 72, fig. 26). 76 On the specific question of the completion of the tombs, see M. Baud, « Du complexe enterré au mastaba révélé : l’invention de l’architecture funéraire et des dispositifs cultuels », in M. Étienne (dir. ), Les Portes du Ciel. Visions du monde dans l’Égypte ancienne (cat. d’exp., 6 mars - 29 juin 2009), Musée du Louvre, Paris 2009, pp. 206- 207. 77 Dreyer (Günter) et al., « Umm el-Qa’ab. Nachuntersuchungen im frühzeitlichen Königsfriedhof 19./20./21. Vorbericht », Mitteilungen des Deutschen Archäologischen Instituts Abteilung Kairo 67 (2011), p. 83, figg. 35-37. 78 Petrie, RT I, pp. 6, 15.